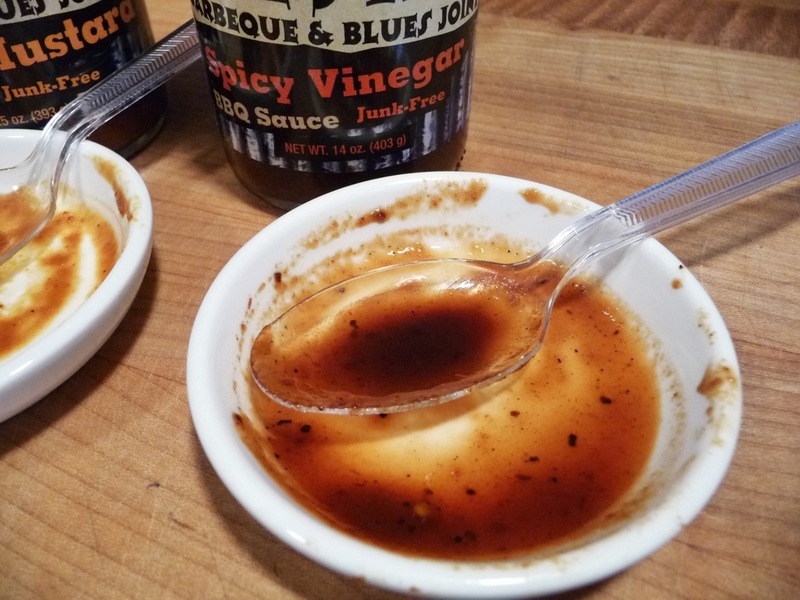 We pulled out some of our smoky pulled pork that we cooked on our Weber Kettle recently, from the freezer to give these two sauces a taste test. One, a vinegar BBQ sauce, the other a spicy mustard BBQ sauce – what could be more perfect on pulled pork? Or, what could go wrong? 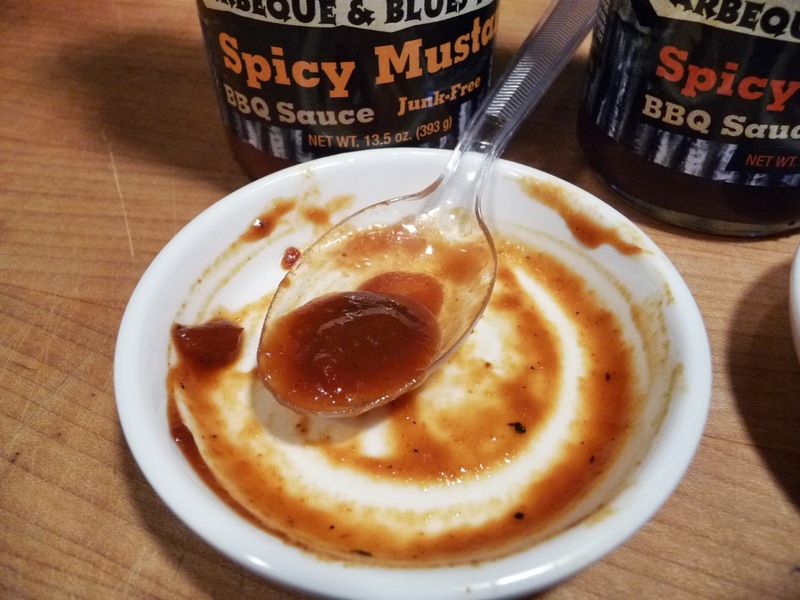 We’re starting with two of the lineup of 7 sauces from The Shed Barbeque and Blues Joint – might as well jump right into the spicy versions, right? The Shed Spicy Mustard is their take on a sweet, mustardy sauce found in the deep South, while the Spicy Vinegar is The Shed’s kicked up version of an Eastern Carolina “red sauce”. We had high hopes for both of these sauces, but straight up out of the bottle, one was our favorite. Then things changed. Brian: I’m a sucker for a good mustard based BBQ sauce. I fell in love with Reverend Marvin’s at first, and then The Country Chef’s Grilling Sauce (the latter may not be in business any longer). So I was excited to try The Shed’s Spicy Mustard! Marilyn: While I’m not the big fan of mustard anything, like Brian is, I was not going to turn down a chance to see what The Shed thinks is a good mustard BBQ sauce. Brian: Tasting straight up out of the bottle, this was good! It reminded me of the sauce in a really good baked bean recipe – one that you cook for hours over coals. Spicy and mustardy, the heat comes from the added hot sauce and jalapeños. Very unique for a mustard BBQ sauce. Marilyn: I first tasted pepper, mustard, then the vinegar. The heat was on the “hot” side but with a very smooth “burn”. The sweetness was there, but not overly sweet. Very savory too – think mustard, worcestershire sauce and onion. 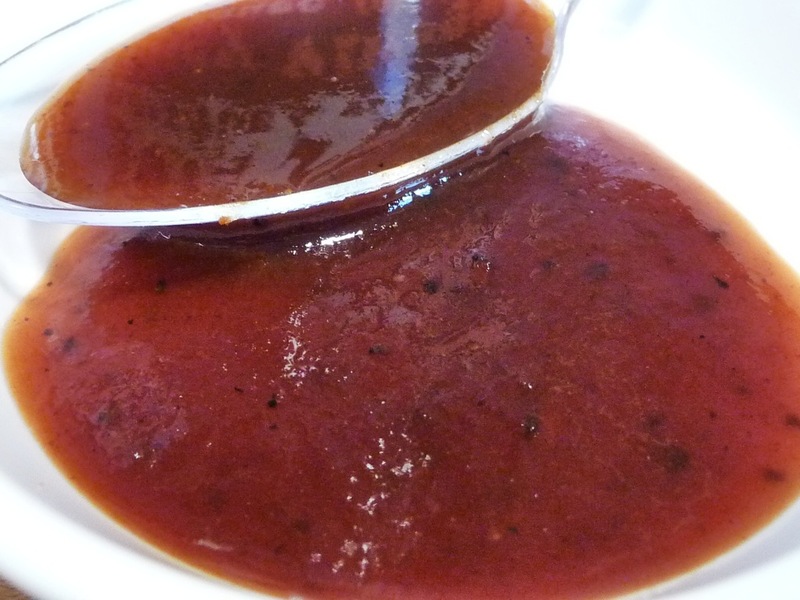 Brian: This mustard BBQ sauce is very dark in color – not your typical yellow mustard look. It has a nice, medium-thick consistency – not too gloppy, not too thin. Marilyn: It does have a dark rust color like a rusted tin roof (The Shed?). It doesn’t run, it’s fairly thick. This sauce has a great texture and body. 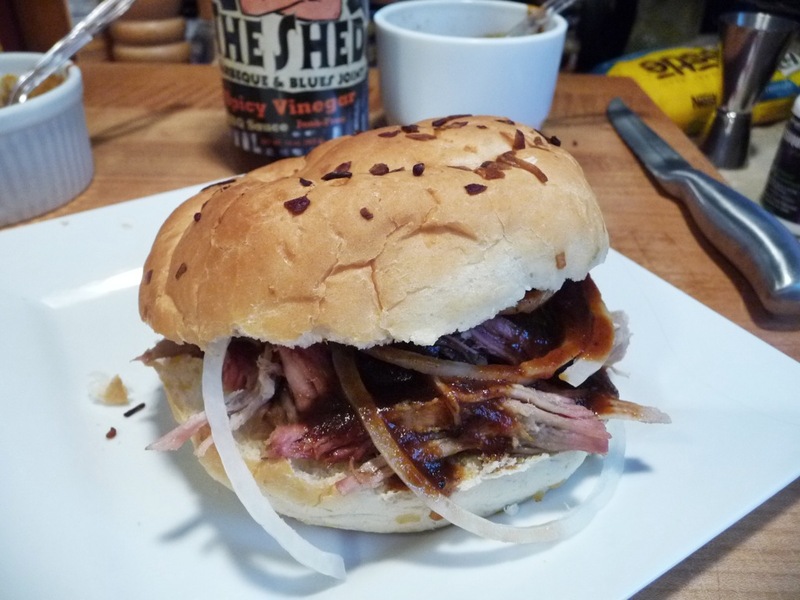 Brian: We heated up the The Shed Spicy Mustard BBQ sauce gently, then poured it on the pulled pork and built a couple of beautiful sandwiches. Did the sauce taste as good on the sandwich as out of the bottle? I don’t think so. Something was lost in the heating process, and it turned out to taste more like mustard and less like a BBQ sauce. Marilyn: Yea, I agree something got lost in translation. We should try it without the coleslaw, that may have added an extra tang that emphasized the mustard flavor over the BBQ flavor. This sauce might be better suited for pork tenderloin. 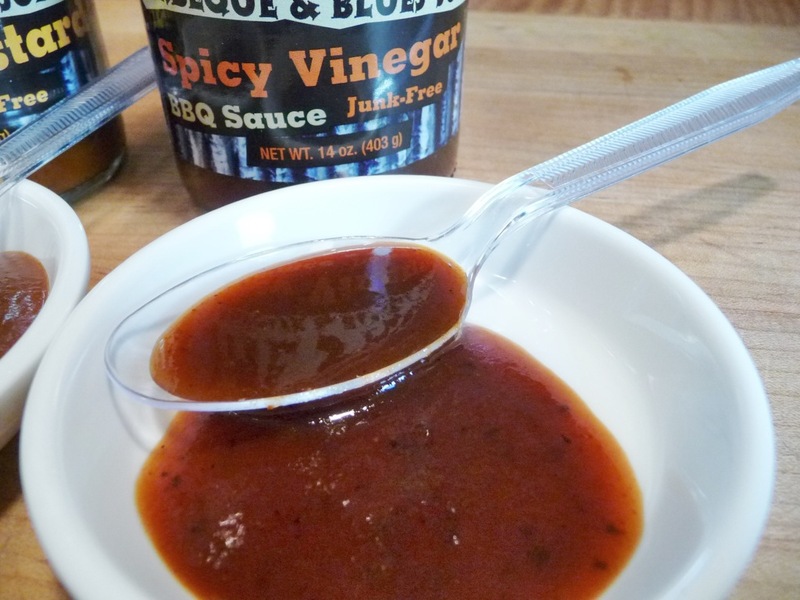 Brian: I’m not a big fan of the simple Eastern Carolina style red sauces – which are basically cider vinegar and red pepper flakes, but I could see The Shed Spicy Vinegar was a slightly thicker kicked up version of that plain concoction. This is going to be good. 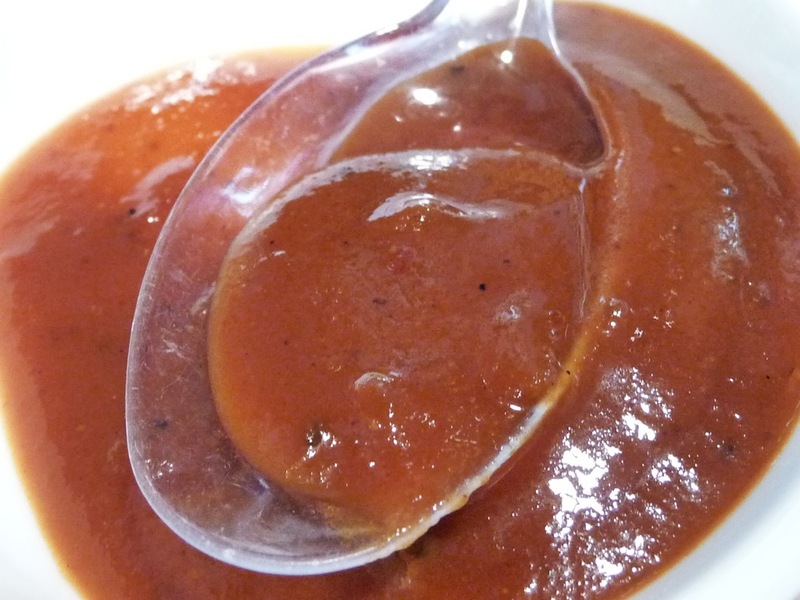 Marilyn: I was happy to see a tomato / brown sugar base in this version of a Carolina sauce. Like Brian, I don’t care for the simple vinegar pepper flakes combo either. Brian: Sweet, tomatoey, with a hint of traditional BBQ sauce. Just as I suspected, it’s a nod to the traditional Carolina vinegar sauces, but with body and flavor. Reminds me of Blues BBQ Carolina Pepper Sauce. Marilyn: First up, I get a little pucker from the cider vinegar. It’s a little bit sweet and I love the tomato taste – a really nice addition! It reminded me of Bone Suckin’ Sauce. Brian: Very dark in color and of a medium-light thickness. You can see the seasonings in it. Marilyn: This sauce tends to “separate” a little – think puddles. Light in body, not too thin. Can’t wait to try this on the pulled pork. Not too thin with great tomato body and flavor. Brian: Again, we poured this sauce onto our pulled pork sandwiches, this time topping with a few thin rings of fresh onion. The onions and rolls were also a good canvas to serve this sauce on. Marilyn: The smokiness of the pork comes through, and the sauce really shined as a supporting player. Not overpowering at all. What a great balance of tradition – pulled pork, with a vinegar/tomato/spicy thin sauce. A great surprise and a great sauce. We both agreed that the The Shed Spicy Mustard BBQ Sauce was the winner of the straight up taste test. Savory, mustard, spicy… a winner straight out of the bottle. But after heating up the sauces, the Spicy Mustard just became, well, a mustard slather. 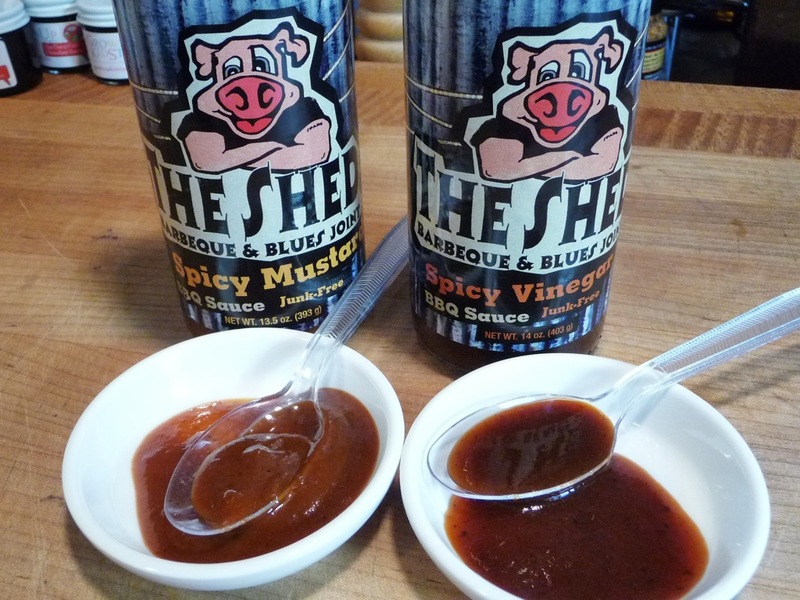 Our favorite of the two sauces was The Shed Spicy Vinegar BBQ Sauce – by a long shot. We’re not giving up on the Spicy Mustard just yet… we have wings and pork to cook it on. 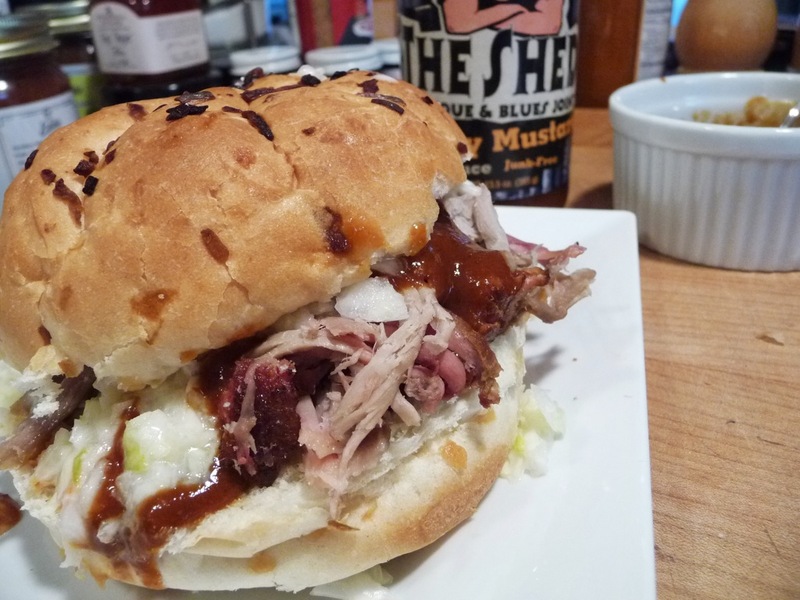 The Shed Spicy Mustard BBQ Sauce – We’ll give this 2 Stars because we think it has potential. 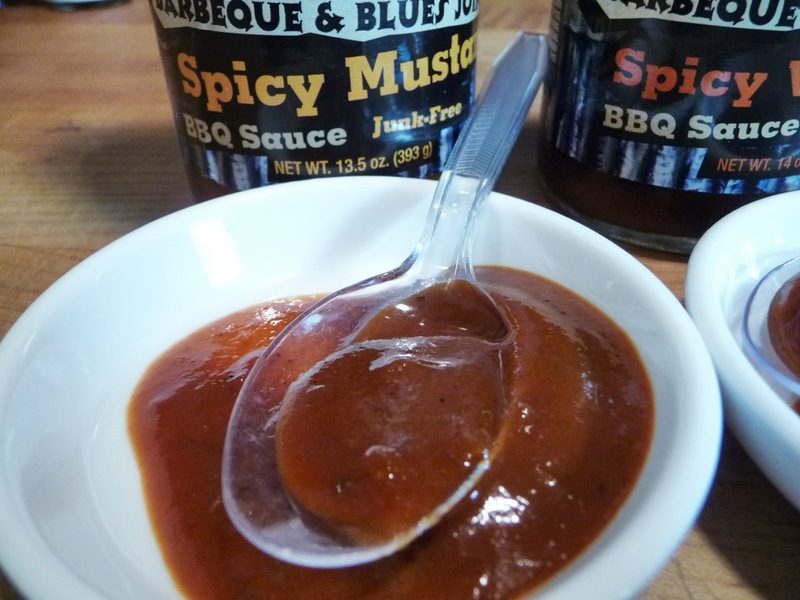 You backyard grillers may want to kick this up a bit with your own rubs or sauces. 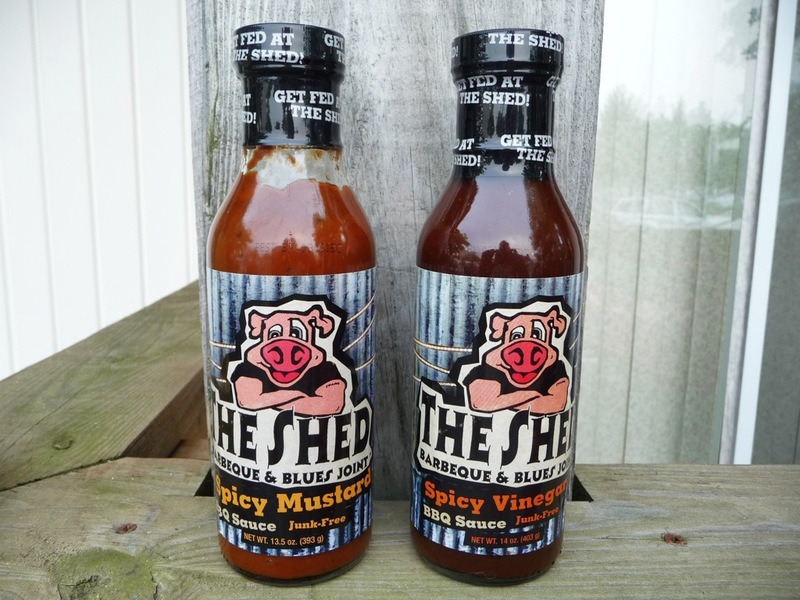 The Shed Spicy Vinegar BBQ Sauce – This sauce is 4½ Star worthy because of it’s great flavor, punch and overall quality. A big winner in our book. 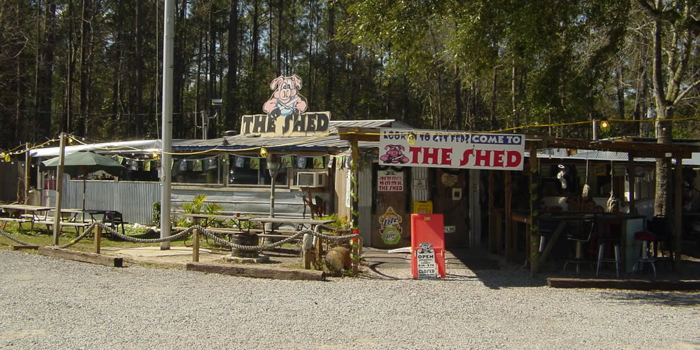 The Shed Barbeque and Blues Joint out of Ocean Springs, Mississippi, is famous on numerous levels. Their BBQ sauces helped them win a Memphis in May Championship, an NBBQA Award of Excellence and have been featured on many TV shows including Diners, Drive-Ins and Dives, and most recently on Diva Q’s BBQ Crawl. You can read more about The Shed Story here. And be sure and shop for their sauces at their online store here.